Verigated Manihot Tapioca Esculenta Or Cassava(5 inch) 2 Stem Cuttings for Growing. 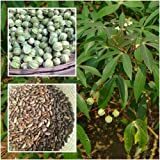 Cassava plant for sale – Easy plant to grow with edible roots and leaves, planting in spring (as annual) or spring to autumn (as perennial), better to buy plant or cutting. Growing information: perennial plant also can grow as annual, growing hardiness zone: 10+(as perennial), in colder zones can grow in the annual if you have long summer, water needed – average to big amount, light conditions – full sun, height: 1-5m, 3-15 feet. Root harvesting in the autumn but can be when the plant mature, can be used cooked, roasted or on fire.